Thomas and I made this playdough before our Pizza Party with the thought that we would play with it at the pizza party. We didn’t. We just didn’t get time! 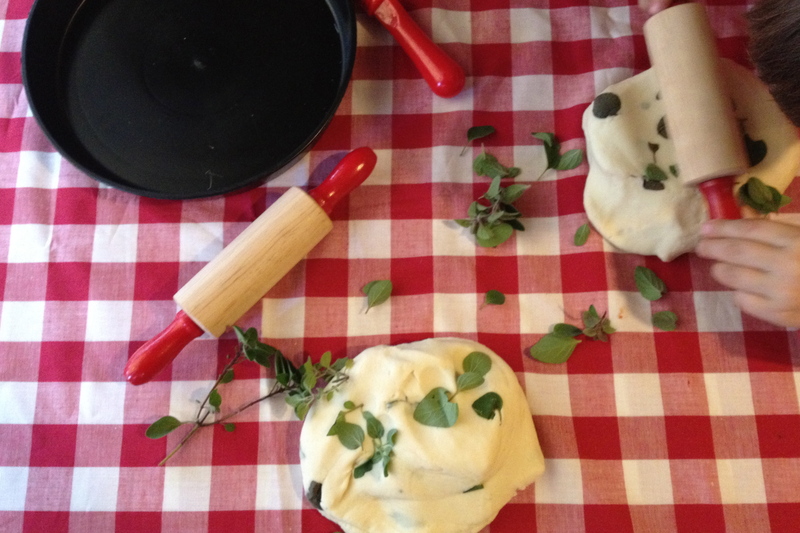 There was too much pizza making going on to play with playdough! 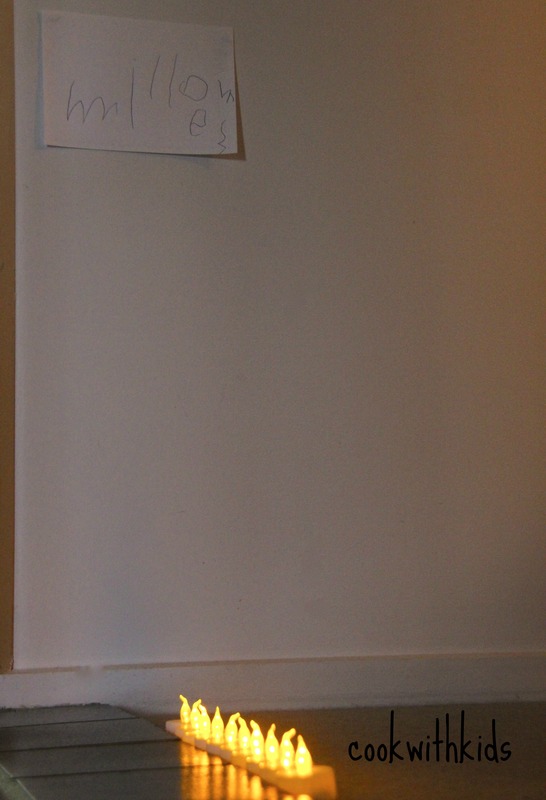 So, we brought it home and after a rest, Thomas and I created our own pizza restaurant. He had a fantastic time role playing making the pizza and exploring the making of the pizza’s all over again. My little guy loves imaginative play at the moment. He’s always thinking up new games that involve his dolls or little people so this was right up his alley! Now pizza playdough isn’t at all difficult. I used the Imagination Tree’s 4 minute no cook playdough which I LOVE! 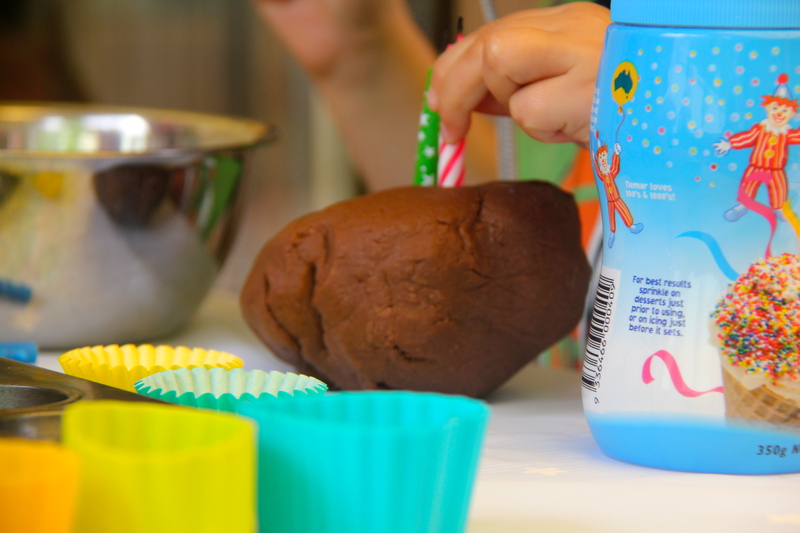 It lasts for so long and is so versatile I don’t think I’ll ever bother with another playdough recipe! 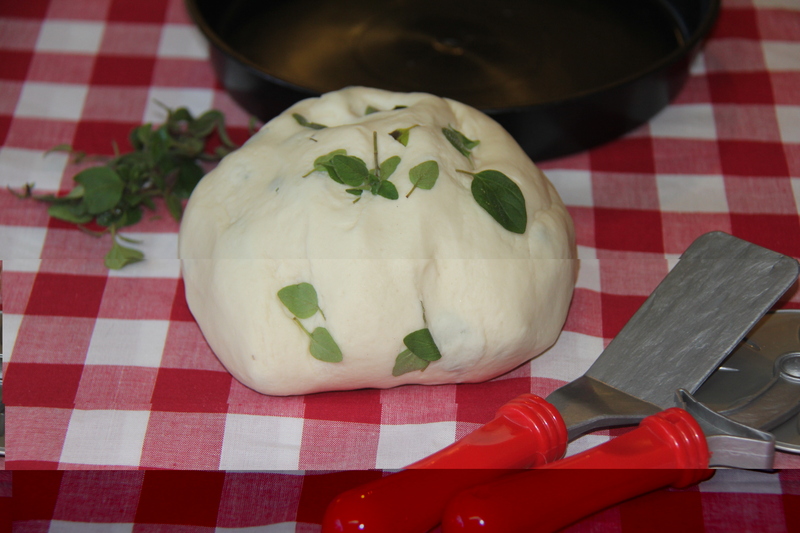 And to this recipe, we just added some oregano leaves that we picked from our garden. You could use any herbs you like really. Rosemary and parsley would also be good ones. I kept some leaves and Thomas enjoyed adding them as he was making his pizza. 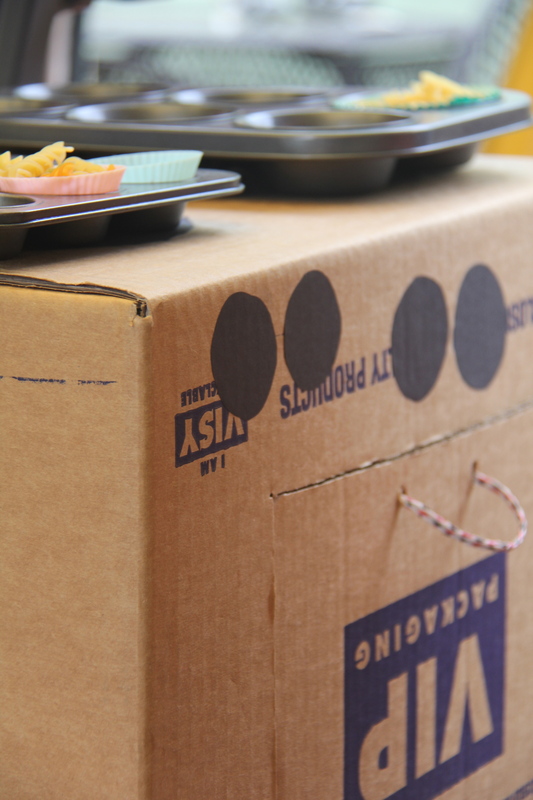 We also used our cardboard oven that we made ages ago. It has stood the test of time and comes in handy when we do imaginary cooking like this, although it is a bit of a pain to store! We had a great afternoon playing with this playdough. Thomas used his fine motor skills and large muscles to cut and roll the dough. The language and conversation being had was wonderful. To extend this experience we might make some menus and have some paper and pens to take orders – and make a ‘real’ restaurant. Or we might make some different coloured playdough to add different toppings to our pizza’s. 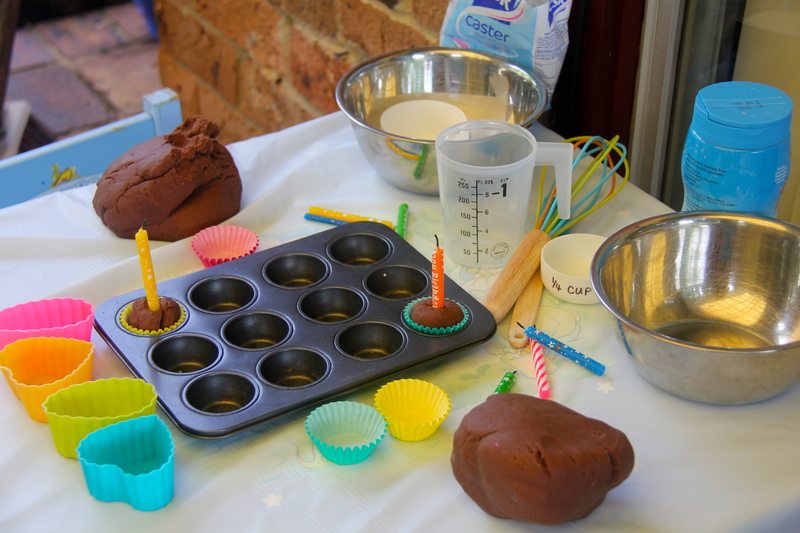 Baking materials – we used whisks, silicone patty cases, paper patty cases, cup measures, spoons, baking trays and a scale. You are only limited by your imagination in what you put with it, see where your child takes the activity and you might like to add things like cook books, oven mitts, cookie cutters etc. My suggestion is that you do this activity outside as it can get quite messy, although it is quite easily swept up. 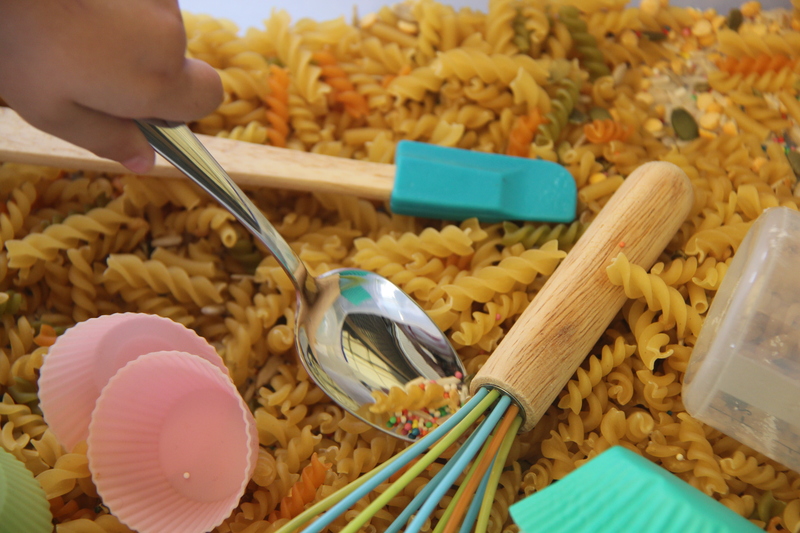 Combine all the ‘ingredients’ in the tub and have fun! It was interesting to see the 2 children playing with this activity today. Thomas immediately wanted to use the scales while H. got right into making some “biscuits” using the trays and patty cases. They both used the spoons to scoop the dry ingredients out of the tub and put them into the bowls and patty cases. 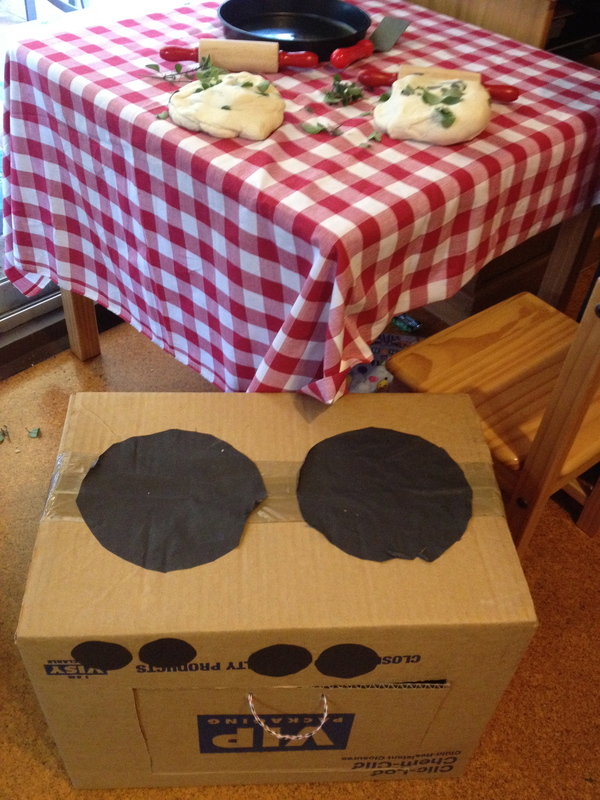 We added our oven that we made a couple of weeks ago too which allowed the kids a place to cook what they had made. At one stage Thomas said to me “What do I do now?”. I guess he is used to ‘real’ cooking, following a recipe and achieving an outcome so it was quite different for him to be doing this ‘unstructured’ cooking. 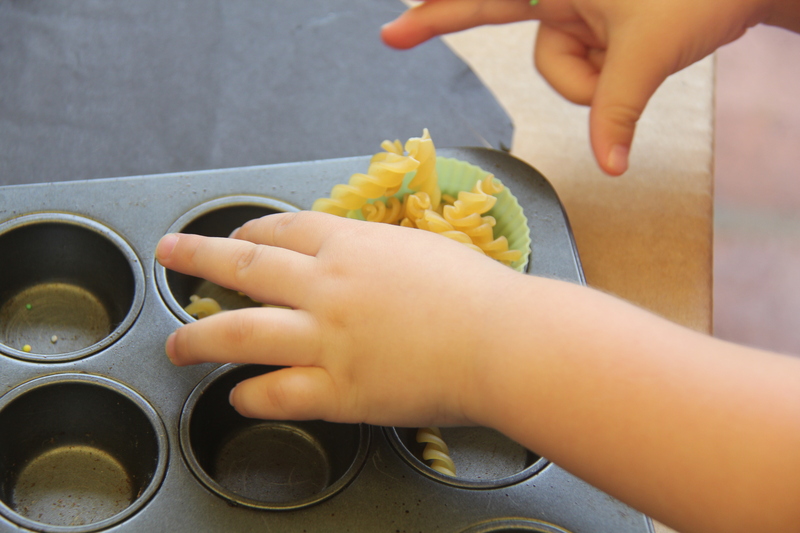 I was pleased to be able to offer him a different dimension to cooking and allow him a little freedom to explore his own creativity and imagination. I’m looking forward to playing with the sensory tub with him again to see where it might lead now that he has more of an idea of the concept. Exploring size using the big and little patty cases, problem solving which ones went in which trays. Talking about measurement and using terms such as weigh and grams. Initiating and engaging in conversations. There are so many learning outcomes that can be achieved from this activity, it just depends where your children take it….